We’re coming up on our one-year blogiversary at Thinking Through Our Fingers, which means that it’s been almost a year since I wrote my first blog post. Ever. On any blog. 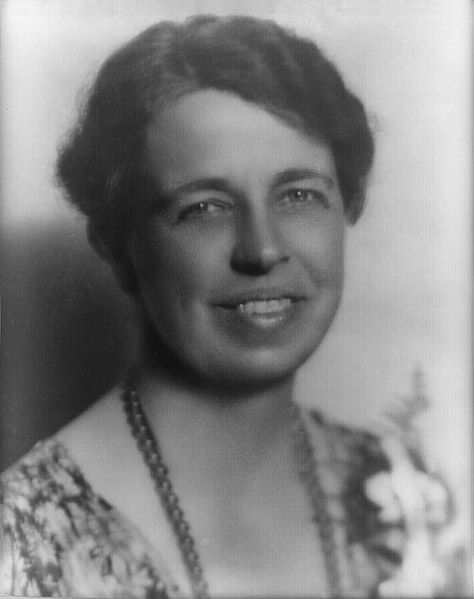 And in that post, I quoted Eleanor Roosevelt. Last night, I was at an informal gathering of friends. Sometimes I come away from social events feeling sort of drained and let down, but not this time. There were, in my opinion, some really great minds there. There were a wide range of professions and world views represented, and I came away feeling uplifted and energized. I think the difference was this: rather than discussing people (neighbors, friends, mother-in-laws, etc.) we discussed ideas–of history, literature, and human nature. It was fabulous. And before you accuse me of being stuffy and pretentious, let me tell you that my husband (who wanted to stay home and watch the baseball game and is as unpretentious and unstuffy as they come) thought it was fabulous too. This is kind of what I talked about today on my blog – great minds 🙂 There is something to be said for having something in the mind to be able to convey. Great post! Yes! The writing that sticks, for me, not only tells a story about people, but makes me think. Those great ideas aren't spelled out plainly, but they're there. Deeper. The good ones make you dig a little. I'm reading Susan Cain's Quiet right now, and I can't help wondering how much of this reaction (valuing thinking over action) comes from an introvert's preference . . .
Also, the “really great minds” thing makes me laugh. I probably would have said “nerds” (in a good way), but I suppose it amounts to the same thing. Thanks to you and Eleanor for the inspirational post!